Hoodoo. Rhymes with voodoo. Doesn’t it sound magical, like a place where someone has cast a spell! Well, Bryce canyon national park sure is a fascinating and extraordinary place. This place has the largest concentration of hoodoos in the world. And what better way to appreciate this otherworldly place than to hike down into the amphitheater and be among the hoodoos. Let me make it easy and choose a trail for you—Navajo loop trail. And here’s what you need to know for hiking Navajo trail in Bryce Canyon national park. Bryce Canyon national park is located in southwestern Utah in the USA. 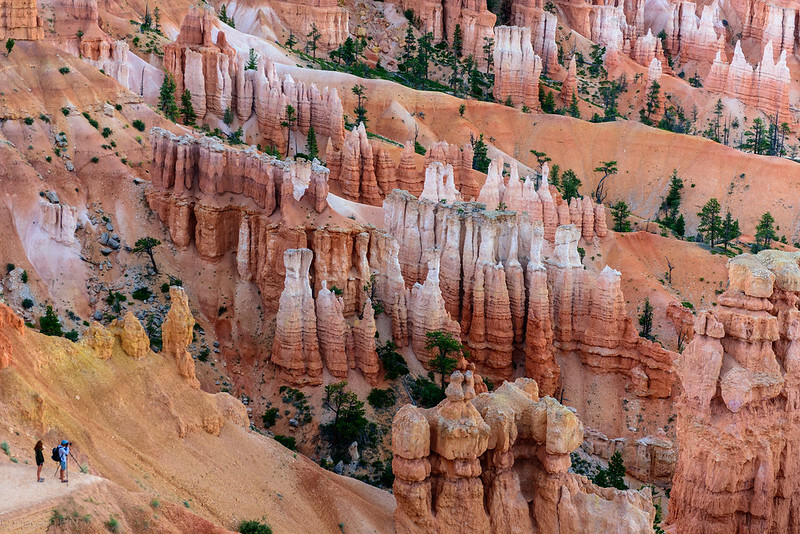 It is famous for its orange, yellow, pink, and white colored hoodoos. So, what is a hoodoo? A hoodoo is a geological pinnacle of sedimentary rock that protrudes from a basin or badland. Yes, it’s as complex as it sounds. 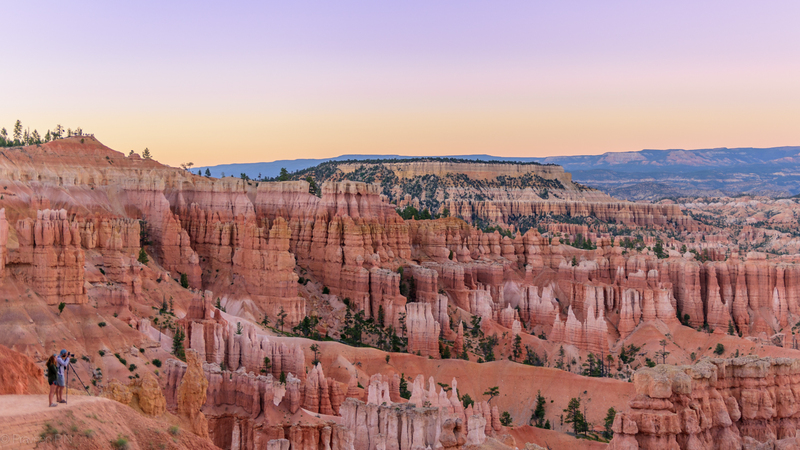 This national park has few marked and maintained hiking trails which are visible from the viewing points —pinkish trails zigzagging among the hoodoos. Navajo loop trail is one of the most popular trails in the park. As the name suggests, this trail is a loop, but people often combine it with the Queens’ garden trail. Trailhead: Navajo trail begins at Sunset point. Sunset point has a fairly large parking lot, restrooms, and few picnic benches. Elevation: Sunset point is at 8000ft. There is a descend and ascend of 550 feet at the start as well as the end of the loop. Difficulty: Navajo loop hike is considered to be moderately difficult and can be completed in 1 to 2 hours. Morning – For soft light falling on the hoodoos and fewer people. Afternoon – When the sun lights the canyon floor and it’s bright and orange-ish around. We hiked Navajo loop trail in the afternoon along with fellow enthusiastic hikers who were undeterred by the scorching sun. You can start the hike either clock-wise or anti-clockwise. Whichever direction you take to descend the canyon, sights are stunning. However, many people recommend to start this hike clockwise. You choose. These sights await you on Navajo trail—Thor’s hammer, Twin bridges, and Wall street. And if you are wondering how to get to the slot canyon you have been hearing of, this is the trail to take. Wall street is the only slot canyon within the park. Wall street section of the park may be closed during winter. Navajo trail also has a series of long and short switchbacks leading to the canyon floor. And once you reach the canyon floor, you see Douglas firs and Ponderosa pines towering among the hoodoos. The contrast of the greens of the trees and the orange of the hoodoos is absolutely stunning. I repeat: seeing the hoodoos from down below is a must. And for that if you have to choose one trail, I recommend the Navajo loop trail. And if this doesn’t satiate you, combine Navajo trail with Queen’s garden trail for a longer stroll (approx. 3 miles) among the hoodoos. This will also eliminate the steep ascend. What is GPSmyCity? GPSmyCity provides walking guides (for both iOS and Android) for over 1000+ cities worldwide along with city maps and travel articles. To know more about them click here. One lucky winner will get a full one year membership of GPSmycity app with access to ALL the GPSmyCity content – over 6,500 self-guided city walks and travel articles worth over $8000. Here’s what you need to do: Just answer this simple question by commenting on the post. Which city are you currently exploring or planning to explore this summer? Giveaway closes on 28th August 2017 11pm PST. We will randomly select a lucky winner. Winner will be contacted through e-mail. Wow! Quite a spectacular creation of nature! One of the special places. We hope to explore Seattle. Hey Susan, please let me know whether you would like GPSmycity app (one year free subscription) for iOS/Android.